Lavazza has partnered with local UK football teams Arsenal and Liverpool and features select players from both clubs in its newest advertising campaign, aimed at discovering what the REAL Italian coffee is. 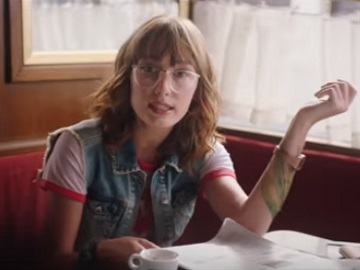 One of the spots, titled “More than Italian”, opens with a young woman wearing red high heel entering a coffee shop and telling the barista she would like to taste a real Italian coffee. At this point, a variety of characters are featured, asking what kind of coffee she wants, listing the numerous options available, from capsule to Americano, to espresso, to cappuccino, to black coffee, to flat white, and more. “She wants a real Italian coffee!” a guy highlights, which makes a woman in a diner raising the question “What is the real Italian coffee”? The answer comes at the end of the commercial, which features the barista putting in front of the respective lady a cup of Lavazza. “Yes, Lavazza. Espresso and more,” the voiceover says, urging viewers to “discover the Italian coffee experience in all its forms” and adding the tagline “Lavazza – More Than Italian”. Lavazza, which became, on October 30, 2018, the official coffee partner for both Arsenal and Liverpool Football Clubs, will serve, over the coming three years, as the exclusive coffee supplier at both Emirates and Anfield Stadium. Founded in Turin, in 1895, not long after the creation of both clubs, the Italian family company and the two English football teams share, according to Carlo Colp, Lavazza Global Head of Marketing Communication, “the same passion for excellence, innovation, and tradition”. The coffee brand also serves as the only food and beverage brand sponsor of all four tennis Grand Slams, which includes Wimbledon. Lavazza also partners in local markets with other premium events such as Royal Ascot (UK), the Mercedes Cup (Germany), and CHIO Aachen (Germany).